The human body is composed of several trillion cells. All of them originate from the same single fertilized egg, yet almost all of them have become specialized to perform certain tasks. But all of the body’s cells (except for the lymphocytes) contain the same genes, so how does one cell become a nerve cell rather than, say, a liver cell? This question troubled biologists for many years. The answer lies in the fact that not all the genes in a cell are activated at the same time. Some proteins in the nuclei of cells will, by binding to their DNA, trigger the expression of only certain genes of this DNA. And the product of these particular genes will be a protein whose function will contribute to making the cell more specialized. Several of the proteins that can bind to DNA come from genes which, when expressed, give the cell a specialty specific to its position in the body. The term homeotic genes designates these genes that encode proteins that bind to specific sequences of DNA and thus influence the organism’s subsequent development. These specific sequences of DNA are called homeoboxes. The proteins that arise from a gene containing a homeobox sequence can bind to another gene in turn, thus triggering a cascade of gene expressions resulting in the segmentation of the embryo. We thus can see how certain “master” homeotic genes control the transcription of a set of secondary genes that in turn influence the activity of other target genes at a lower level in the hierarchy. These genes will then produce the proteins used to build the structures and organs of the body. Certain genes that contain the homeobox sequence, the hox genes, are grouped one after the other along certain chromosomes (see diagram to right). In addition, the order of this alignment reflects the positions of the body parts that these genes control. Through the regulatory proteins that they produce, the hox genes orchestrate the entire anatomical structure of the body, including the nervous system. 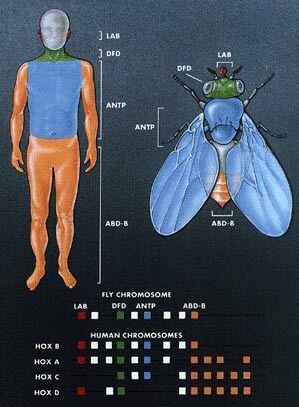 Because the homeobox sequence has remained almost unchanged over millions of years of evolution in many species, homeotic genes would appear to play a vital role in the general organization of the body in almost all animals, including worms, flies, birds, mice, and humans. When the function of a homeotic gene is disturbed by a genetic mutation, entire parts of the body can develop at the wrong location. 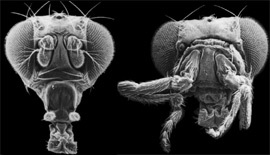 There are several known examples of these “homeotic”mutations, such as the Antennapedia mutation, in which the Drosophila fly develops legs where its antennae should be (see photo). This mutation is due to the expression of the Antennapedia gene at a site that is too anterior, which causes an anterior segment to be transformed into a normally posterior one. In the human brain, certain developmental disorders, such as autism and various forms of mental retardation, are associated with mutations of the homeobox genes.